I am looking for an Anakin (III)/Luke Skywalker (IV, V) replica lightsaber to eventually be placed in a nice glass case used as a decoration/conversation piece among my other Star Wars memorabilia. I know there have been many different manufacturers of some nice realistic ones. For people who have them, which would you recommend: ICONS, MASTER REPLICAS, or HASBRO? I'm sorry but I don't know much about Hasbro's. Of the other two, I would say Master Replicas, Luke Skywalker Episode V.
Icons' is a mix of the ANH and ESB props, while MR's is a version of Luke's lightsaber that we see in the Wampa's cave in ESB. Master Replicas' replicas of the Anakin's lightsaber in ROTS are good replicas of those props used in that film... but those were in turn a bit different in detail from the props used in the filming of ANH and ESB. Don't confuse any of these sabers with Anakin's from AOTC, which is completely different. Disclaimer, though: I don't own any of these replicas, but I have seen and held them in person. My own lightsaber replica consists of a vintage Graflex flash gun and custom-made parts. I'm pretty sure Master Replicas made each of these. So I would suggest you do some research and see which one you like. I myself prefer Luke's Episode IV saber. I have the Icons version. It's a reasonable replica, but if you want it to be as accurate as possible, you need to build one yourself using a real Graflex flash gun. I saw a Black Series, Force FX Lightsaber on sale from Hasbro. It has a blue blade, but I’m not sure whether it is from IV or V. I say this because I currently have no unedited copies, and I can’t figure out which lightsaber I’m looking at when I watch my 97 tapes or my Blu-Rays. The lightsaber runs about $150, but depending on where and when you get it, the price may change. Also, there are many reviews that the lightsaber is not very loud, so don’t be surprised when you get it. I have the Hasbro Force FX Luke lightsaber from a couple of years ago. If this is the same as the one they’re currently selling, it’s pretty nice. It’s a replica of the ANH saber hilt with the bubble switch and no rivets in the rubber grips. As far as I can tell it’s quite accurate to the original prop. It also has the really neat feature of the fx blade being removable. It comes with an insert to put in where the blade comes out so it looks totally screen accurate when “off”. The blade is nice and vibrant and the sound effects are good. The motion control and impact activation of the sound effects works well. I also have an older Master Replicas Vader ANH force fx lightsaber. Comparing the two, the master replicas sound IS louder, but not so much so that it makes much difference, IMO. The master replicas also seems to have more individual lights in the blade so that the power up extension and power down retraction of the blade looks a bit smoother or more natural. But again, it’s a minor difference. But with the awesome removable blade feature, I actually kinda prefer the Hasbro saber. I wish they were still in the $100-$120 range but even at $150 it’s really hard to go wrong. The removable blade Hasbro sabers are really fun to play with and they make wonderful display pieces with or without the blade. Here’s a little illustration that might help you figure out the differences between the props. It doesn’t show how both OT sabers hung from the belt via a “D” shaped ring bolted to the bottom, whereas the ROTS hilt has the standard prequel style attachment where a black plastic circle on the side of the hilt snapped into a clip on the belt. There’s a new(ish) guy in Texas who is making exact Graflex flashgun replicas (the camera part the original prop was made of). www.romanprops.com. They’re beautiful. Then I’d recommend SlothFurnace for the circuit card, and a guy named WannaWanga has good kits to convert the flashgun to a lightsaber. Google/bing them and you should find their stores. If I were doing it, that’s what I’d do. Not that I’ve thought about it much or anything… ☺ May the Force be with you! I have an Icons Episode IV, which came without the blade. It’s quite nice and totally fits the bill as a conversation piece. That said, if you really want something realistic, the best thing is to find an actual Graflex and convert it yourself. And like others have said, bear in mind that the sabers from III, IV, and V are all different, so you’ll need to decide which one you want. 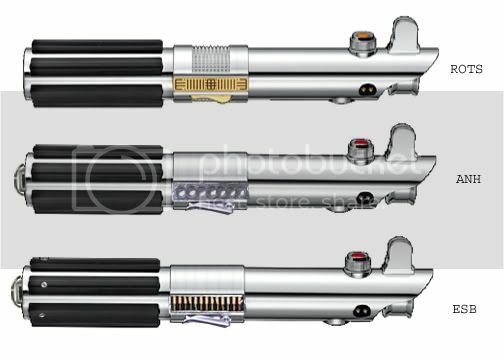 Sabers from IV and V can be converted from a Graflex, whereas with Episode III you’re stuck buying a licensed replica because of the differences. […]if you really want something realistic, the best thing is to find an actual Graflex and convert it yourself. Anyone know the best UK manufacturers? It’s also worth checking out etsy.com/uk for lightsabers too - some decent offers on there, and not too bad on the postage - even coming from the US or Far East. A couple of months ago I ordered a ‘Kyojin’ lightsaber from The Pach Store in Singapore (I am in the UK) as a present. Only took 2/3 weeks to arrive - packaged very well & securely, and the quality for the price was outstanding at $59 (£47), plus p&p. Superb value for money in my humble opinion - though obviously it doesn’t resemble anything that appears in the films. Have seen a few people ‘weather’ or ‘battle damage’ theirs, adding customisations such as leather straps - or painting some of the recesses a differing colour etc. The same saber can be bought in the UK from https://thesaberarmory.com/product-category/hilts/complete-lightsabers/ - called an ‘ECO Saber’ on their site - for £59 plus p&p. Though it’s probably best to look around on the some of the various lightsaber forums, youtube reviews and videos before making your mind up whatever you may opt for. PS - it’s also worth having a look around for a decent quality stand or mount for the saber too.